I (Jack Kooyman) recently wrote the following and posted it on the Christian Reformed Church Network site. I decided to share it here because I because I believe it offers important and useful insights and perspectives for anyone engaged in ministry with those on the margins of society. 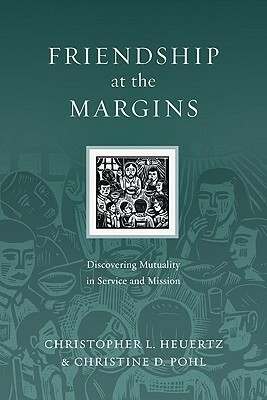 When I began reading, Friendship at the Margins by Christopher L. Heuertz and Christine D. Pohl, I quickly realized that it would be a valuable resource for deacons and others engaged in “word and deed” ministries or missions with individuals on the margins of society. I have gained a much greater appreciation for the importance and priority of and need for developing genuine friendships with those we serve. In our anonymous and dehumanized world, the simple practice of friendship is radically counter-cultural. But sometimes Christians inadvertently marginalize and objectify the very ones they most want to serve. The book’s authors, Heuertz, founding partner of Gravity: a Center for Contemplative Activism, and theologian and ethicist Christine Pohl, show how friendship is a Christian vocation that can bring reconciliation and healing to our broken world. They contend that unlikely friendships are at the center of an alternative paradigm for mission, where people are not objectified as potential converts but encountered in a relationship of mutuality and reciprocity. When we befriend those on the margins of society by practicing hospitality and welcome, we create communities where righteousness and justice can be lived out. Heuertz and Pohl’s reflections offer fresh insight into Christian mission and what it means to be the church in the world today. Visit the InterVarsity Press website to learn more about the book’s contents, read reviews and, if you choose, purchase at a 20% discount. Posted in Deacons, Diaconal Ministries, HDC News, Resources, Uncategorized and tagged Community, Community Ministry, friendship, missional by HDC.